The latest push appears to be finding some support among Republicans, who now control the House and Senate and who see the ban as a government intrusion on personal freedom. My response? What about all those servers, bartenders, barbacks, cleaners, managers etc. who also want the freedom to breathe clean air? Don’t they deserve that freedom? Workplace safety is not a choice, it’s a right. Anyone has the right to smoke, but they don’t have the right to poison other people’s lungs. You fill in your contact information and then a letter is generated to your Minnesota senator. It’s not hard to do, but it’s not very intuitive either. Once you complete the form, you go to another page to print your letters. At the bottom of the page, there are links to share it on Facebook etc. I tried it a couple of times and oddly, different representatives came up each time. First Senator Richard Cohen and then Representative Erin Murphy. The form letter was different, as well. This made me think, well why don’t I get to choose to whom I should send the letter to? Is there someone else I should contact? Effective marketing? C+ for making an effort. 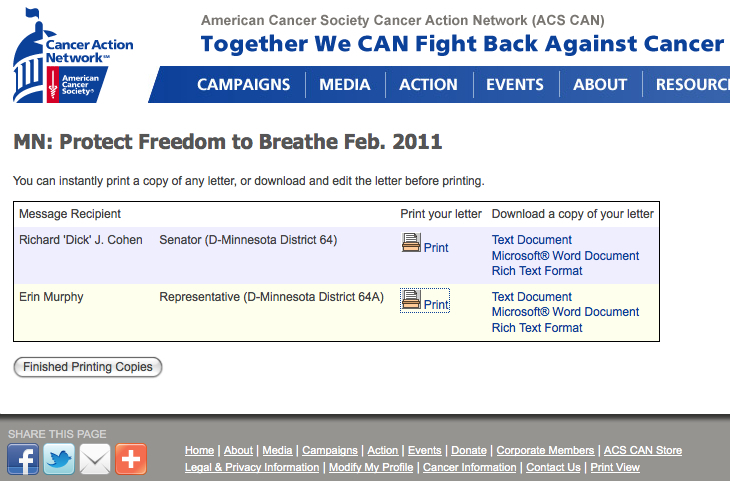 Social Media, well the American Cancer Society does have a Facebook fan page, but there’s nothing about Minnesota and their opposition to House File 188/Senate File 168. And Twitter, well no Twitter feed either. The American Cancer Society Action Network, tweets, has fans, and shares video, but I can’t figure out how they are related to the American Cancer Society. On a side note, I do love their tagline: the Official Sponsor of Birthdays. What fabulous positioning. I’m doing my best to make up for that though–please Tweet this and include the hashtag #MNSmokingBan so we can raise awareness — a principle goal of good marketing. Now, many communities have fines if your dog takes a dump and you don’t pick it up. I highly doubt there are very many people who shout “my dog has a right to do whatever he wants wherever and whenever he wants!” Nor would many be happy to utilize public bike paths and parks and be subjected to the smell or even to step in it. So as I leaned down to pick up my dog’s pile of steaming poo, I realized I can hold my breath for a little while, and if it gets on my shoe, I can scrape it off and go about my day. I can’t do that with secondhand smoke. The survey, conducted every three years by the Minnesota Department of Health, suggests that the state’s controversial 2007 indoor smoking ban has produced a dramatic shift in Minnesotans’ thinking on the hazards of cigarette smoke. How dramatic? A majority of smokers now refuse to smoke in their own homes, the survey found. However, the major part of the controversy in 2007 was on the ban’s impact on bars and restaurants as there were fears it would drive them out of business. A separate study by the University of Minnesota indicates that the smoking ban hasn’t caused economic harm. An analysis of employment data from 2004 to 2008, the latest data available, showed no sign that the legislation hurt hiring in that industry. Almost all the reviewed studies reported, on average, no net loss and sometimes net increases in bar or restaurant sales after smoking bans went into effect. These estimates are for total sales and for the proportion of sales within a county. And we all wonder why we have a state deficit that is so high!! We don’t need to readdress the smoking issue! Let’s focus on issues that need to be addressed like health care and jobs!!! It would be interesting to know if those Republican’s bringing this up are smokers? The economic effects are a whole other story. I have a lot friends in this industry, as well as friends, who just like to go out. Of all the owners, I know–granted not that many since I left the beverage industry–all have said that business is up. All my going out friends and family, go out MORE because of the ban. This very unscientific survey supports my own theory that business is UP for bars that serve food or host music and down for bars that only serve alcohol. Why? Because alcohol, like nicotine is addictive. Those that drink a lot, tend to smoke a lot. No ban will make people smoke less (I wish there were a magic cure for that), but at least, let’s not share the pain. I think if you’re going to allow smoking indoors ANYWHERE, then you need to have a smoking ONLY business. That means your business ONLY sells smoking products, allows you to smoke them inside their facility, and would ONLY hire on the understanding that it is a smoking environment. I believe that in this instance, you could allow smoking indoors… otherwise, I agree with keeping it out of bars and restaurants. Now that I’m a non-smoker, I hate to smell of smoke, especially when I’m eatting. I saw this article, too, and I have two thoughts. First, I agree with the use of the word “stupid” in this situation. With all the very pressing issues we have facing our state, why pick at a wound that’s pretty much already healed? Second is about the marketing angle. One of the promises of Interactive Media was that it would fuel and support the democratic process and community discourse. The American Cancer Society is falling short in using the marketing tools available to them. But I also recognize that it’s easy for me to point this out, not fully understanding the economic and technical hurdles non-profits are facing today. I completely agree. Social media worked in Egypt after all…. As for the non-profit perspective, It think economics certainly play a role, but as you will read in the “New Rules of PR etc,” sometimes people just need to change their mind set, too. After all, last year Facebook was fun, now, it’s aiding revolutions. When I saw this article in the paper I thought I read it wrong!! The whole reason I started going out again was because of the ban. There was nothing worse than the day after being in a bar and I could smell the stale smell of cigarettes! Plus I have allergies, and it almost made it impossible for me to have fun. Seriously, what a waste of time to revisit this..again! Growing up in a small town and with a parent that smoked I have to say I was relieved when the smoking ban was initiated. I really don’t have any input whether or not people smoke but I do LOVE the way my hair and clothes (especially those ever expensive dry-clean only coats, suits, etc.) do not smell like I have been rolling around on a bed of tobacco for the last 8 hours. And no one can dispute the health benefits of the smoking ban! However, I can understand the concept behind the argument for a business owner, who feels like they should have the power to make the choice whether or not their establishment allows smoking and futhermore the choice of a potential employee to choose to work or not in an establishment that allows smoking. I know my view may not seem very popular, and believe me I am NOT for lifting the smoking ban. My guess would be most places would stick with the smoking ban except for the “bars”. Although, I could be completely naive and my dry cleaning bill could sky rocket! We rarely went out in NC primarily due to the smoke! I agree with your argument to an extent, imagine replacing “smoking” with…required uniforms. Then it makes perfect sense. Now change it to…no blue hair or BMI of <22; then you are infringing on people's right to look how they want. Smoking adds the component of being a proven carcinogen, so the state could take the point of view that they are just reducing health care costs in the future. From a marketing perspective for bars it comes down to economics. There are more non-smokers, who tend (statistically) to make more money, than smokers. If as a bar owner you have to make the decision of who you want to offend more — the 84% of MN adults who don't smoke or the 16% who do. Of course, every bar has their own target market, so maybe one bar attracts smokers and others don't. Most of the negative economic statistics regarding this ban have to do with the decrease in revenue at bars that conduct charitable gambling, which includes activities like pull-tabs, bingo, and raffle sales. From my own personal experience, I would have to say that most pull-tab fans tended to smoke and drink a lot, and gee isn't gambling considered just as addictive as smoking and drinking? Stupid is a perfect word to describe this situation! I also am an allergy sufferer and the smoke made a dinner out into an instant headache the next day regardless if I was sitting on the non-smoking side of the restaurant. We all should know that smoke doesn’t travel across a 5 foot divider in a restaurant because it knows it’s not supposed to be over there! HA! The smoking ban made dining out and going to the bar possible for me. Isn’t there a budget deficit to worry about?